Every Herend hand-painted porcelain item is unique. This artist trained for three years and is painting free-hand. HEREND, Hungary — A slender, dark-haired Hungarian woman seated on a stool inside the Herend Porcelain Manufactory dipped her dainty brush in paint and raised its whisker-fine bristles to a translucent porcelain plate. Our tour group fell dead silent, fearing the slightest movement would break her concentration. But the artist’s hand held steady. Soon, an intricate motif of blue flowers entwined with leafy vines appeared on what would become a pricey piece of Herend porcelain. Herend is the world’s largest manufacturer of hand-crafted luxury porcelain goods, which are sold in 60 countries. 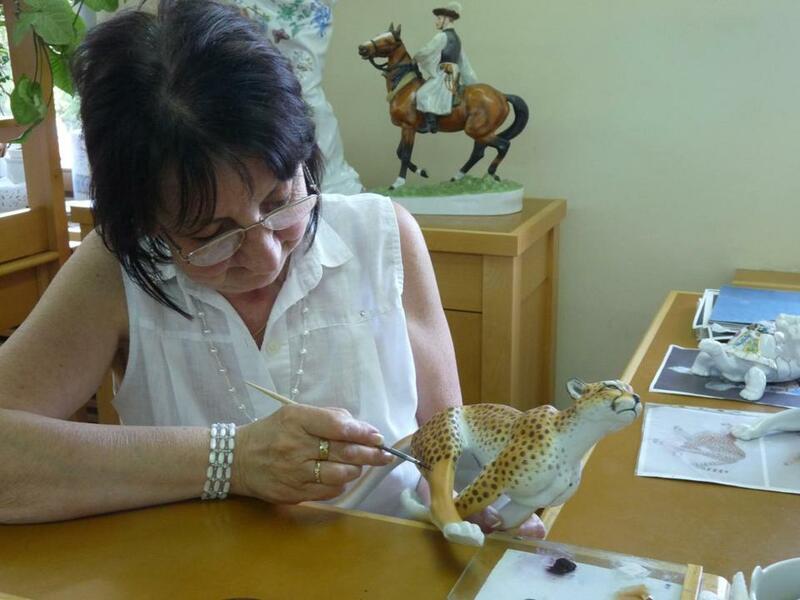 In an age of ubiquitous automation and digital wizardry, the world-famous enterprise in central Hungary has preserved a centuries-old tradition of molding, casting, and painting fine porcelain by hand. Herend’s most famous patterns are named for its illustrious clients, including Queen Victoria, the Esterhazy family, and the House of Rothschild. The porcelain manufacturer was a purveyor to the Hapsburg Dynasty and the aristocracy in Hungary and abroad. More recently, Prince William and Kate Middleton, the Duke and Duchess of Cambridge, received a set of Herend porcelain dishes decorated with a redesigned Victoria pattern as a wedding gift from the Hungarian government. Our interest in Herend porcelain was piqued during an overnight stay at Hedervary Castle, once the home of the counts Hedervary, which is located in the village of Hedevar in northwestern Hungary. Tucked away in a remote hallway of the 16th-century baronial mansion is the exclusive Herend suite, where guests stay amid Herend porcelain antiques painted with the red-and-brown Hedervary colors. Castle manager Bene Gabor unlocked the suite’s antique wooden door with an oversize iron key and showed us one floral platter valued at $30,000. Instantly, we were hooked on Herend and set out a week later in search of the town and factory bearing that name. We drove through vast grain fields and deep forests to reach Herend, just west of Veszprem. Gift shops and etterems (local restaurants) line the streets of the village where founder Vince Stingl established his original stoneware pottery factory in 1826. Bronze busts of Stingl and Mor Fischer, who bought the business in 1839, gaze stoically across Porcelanium Square, an airy plaza framed by massive brick industrial buildings. Flapping banners initially drew us into the Herend Porcelain Museum, a trove of exquisite plates, graceful figurines, and vessels of all shapes and sizes. We walked through an original wood-burning furnace, blackened from use, and admired an immense wine canteen emblazoned with a countryside scene. Outside, we paused to photograph a gaily painted life-size lion in front of the Porcelanium Visitor Centre where we joined an English-speaking tour group for a first-hand look at porcelain making. In a mini-manufacturing facility, we peeked over artisans’ shoulders as they shaped hard-paste porcelain into elephants and eagles, formed plates and vessels on a spinning potter’s wheel, and poured liquefied paste into molds for filigree jewelry boxes. If you go to Herend, Hungary . . . In the painting area, we witnessed the artistic transformation of each fired and glazed piece. Herend’s artists train for three years and may spend up to 16 hours on a single item. One artist painted brown spots on a leopard free-hand while another used a stenciled charcoal pattern to guide her strokes on a flower vase. After painting, pieces are fired one last time to set the colors and enhance 24-karat gold decoration. The fruits of this intensive Old World-style labor are on display, and offered for sale, in the dazzling Victoria Herend Shop, where browsers can easily spend hundreds or thousands of dollars. Lighted glass showcases overflow with floral-accented dinner place settings in a rainbow of color variations, Oriental-themed vases, rose-topped bonbonnieres, and assorted knickknacks. After feasting our eyes on this princely porcelain, we indulged in cappuccino and scrumptious chocolate pastry served, naturally, on elegant Herend plates in the oak-paneled Apicius Café.